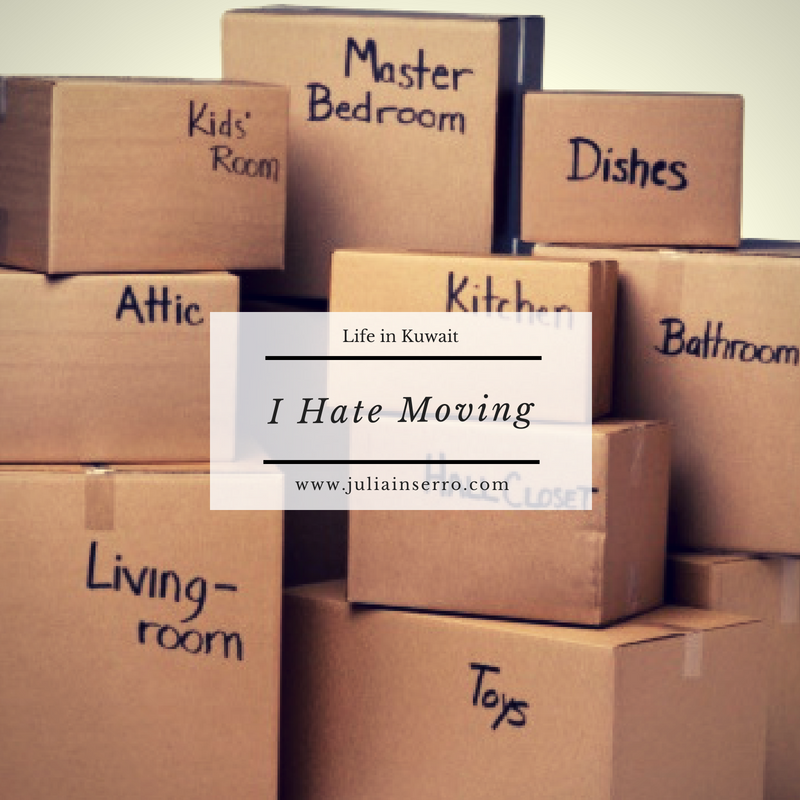 Yes, I realize that me complaining about having to move (again) is like the Queen complaining about yet another hand-waving gig – it’s the lifestyle we’ve chosen (or been born/married into). Although, I have to say when my husband told me on our third date that he’d like to live overseas, I thought he was just trying to impress me. It was only later that I realized that he wasn’t the “try to impress” type – he’s a literal guy. Lesson learned. Which of course leaves me singing, “Here we go again,” and trying not to have a full-fledged panic attack. Since our wedding, almost six years ago, this will be the seventh time movers have come into our home and packed up our stuff. And you’d think that having someone else move you would relieve all the moving-stress. And it does, in many many ways. On moving day, I tend to just try to stay out of the way and keep everyone hydrated and fed. It’s the lead up to moving day that is just as stressful whether you have movers or not. So, six weeks out, as a born and bred list-maker, this is when I start gearing up. I have lists everywhere, and then periodically I merge them into one big list, but then they morph into little lists throughout the house again who eventually have to be re-corralled. But, as a type-A organizer, my little brain doesn’t stop spinning until the last box is packed up. There are a thousand things to think about in order to even reach the point where movers are knocking on the door. First, we have to get the cats prepped for travel, which include rabies shots that are more than 30 days before travel, and then health certificates that are done within 7 days of travel, plus whatever hoops, hurdles and jumps the exporting country and importing country requires. This means at least two vet appointments for three cats (and with three yowling felines and one wiggly toddler, this becomes a family bonding moment as I can’t do it by myself during the week). And don’t forget the airline reservations. You can’t just show up with Mr. Kitty on fly day; he gets his own reservation and then we get the privilege of paying handsomely to use up our own legroom. Gotta love the airlines! Next, we have the purging of the thousands. Nothing is safe; books, clothes, DVDs, shopping bags, kitchen goods, shoes, toys, it’s all subject to intense “do we really need this/is it time to move-along” scrutiny. So donation piles begin to form in room corners and our possessions start walking out the door with friends and neighbors. Then, we have the social-squeezing. Restaurants to visit one more time; friends to see, possibly for the last time, though we never actually say that, “No, we’ll see you again before we leave, I’m sure…”. And the few remaining items on the bucket list (including a possible jaunt to the Iraq border for a picnic, just because we can). Then there’s the using-up phase. This primarily falls to strange food items and toiletries. I diligently start using up all half-empty bottles or tubes of shower gel, face cream, shampoo, toothpaste, body lotion, etc. One by one, they get drained dry and we move on to the next one. Of course, this then raises the question as to why I have so many half-used items, but frankly there’s no time for self-evaluation. Save that for the 13-hour flight. Then there’s the food. You find yourself trying to concoct dinner using up the one-and-a-half bags of dried coconut and half-kilo of paprika. Or staring at the three half-used bottles of vanilla, tub of Crisco and four cans of black beans and thinking about black bean cookies. When I discovered that we had about 15 cans of pumpkin in the cupboard (we had been buying it by the case for Louie the kitten – who needs more fiber – but then found over-cooked rice worked better, hence the pumpkin stash), I had visions of pumpkin pies lined up around the kitchen. But instead, I opted for a slightly healthier recipe, and for weeks on end was making pumpkin smoothies for breakfast. Luckily I love pumpkin, and we’re down to one last can, which I’m saving for any last-minute pumpkin-related emergencies. Hey, it could happen! At the four-week point, we had our pack-out survey done. Typically this is where the moving company rep comes in to assess just how much crap you have. And if you’re not honest, they won’t bring enough supplies, so it’s really “bare your soul, and all your chachka, and don’t hide the alabaster chandelier” time. This time was a little different, as four different moving companies came to review our piles of stuff so they could bid on the job. So I got to confess four times and frankly felt very cleansed after the whole thing. Now, with three weeks to go, I’m finally thinking about actual travel plans. When friends asked what we’re going to do on vacation back in the states, I just stared at them blankly. Frankly, I really have no idea. And currently, “make vacation plans” isn’t even on the master list, though “shave couches” is thanks to kitty claws. I did manage to finally make hotel reservations for us for the first two weeks, so with the plane reservations all set (including feline reservations), we at least all have a place to sleep once the plane lands. I know this is all just a means to an end. And considering the amazing adventures we get to have along the way, I really have nothing to complain about. But, like any adventure, it only comes with a little effort, a dash of forethought, about a thousand lists, and a good pumpkin smoothie to keep things moving. I wonder if the Queen would agree?